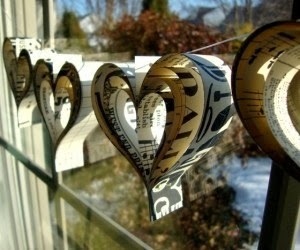 In my search for some Valentine's Day crafts that weren't too pink, I found a lot of these paper heart garlands. The only ones I could find link to adorable Etsy shops, or dead end links, with no tutorial. So I decided to make my own! And these were pretty easy! Start out buying several different pages of scrapbook paper, in patterns that you like paired together. The double-sided paper works best, but most of mine were single sided print, and they work fine. Cut the paper into strips, about 1 inch or 1.5" wide. When you are cutting strips, you will want to (or not) plan and stack them facing in or out, so the left side of the heart ends up mirroring the right side, and they match. I used 4 or 5 strips for each half, so 8 or 10 total. Stack them in the order you like, then staple together at the bottom. You will want to cut the tops of the strips, making the inner ones shorter than the outer, because the inner strips have less far to travel to curve inward to form a heart. Now, the fun part! Get yourself some double sided tape. Take the inner-most strips, and bend them inward, toward the center, and down toward the stapled center. Continue to do the same with the next strips, until you reach the outer-most ones. Form the final heart and then put a couple final pieces of tape on the edges to secure everything together. Repeat with more strips, and make as many hearts as your little heart desires! When you have made a few, use a sturdy needle with a big eye, and string them up on a piece of embroidery thread or other string, and hang the garland in a window, on the mantle, or above a bed! And depending on the color of paper you use, this could be a year round, or at least pretty broadly-seasonal decoration!